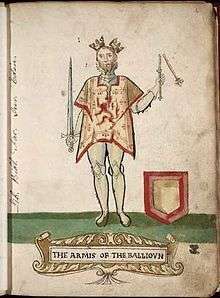 John Balliol (c. 1249 – 25 November 1314) was King of Scots from 1292 to 1296. Little is known of his early life. After the death of Margaret, Maid of Norway, Balliol was chosen as the new King of Scotland by a group of auditors. Edward I of England constantly tried to undermine his reign and demanded that Balliol treat Scotland as a vassal state. As a result, the Scots grew tired of him and appointed a council of twelve to rule instead. This council signed a treaty with France known as the Auld Alliance. In retaliation, Edward invaded Scotland, starting the Wars of Scottish Independence. After a Scottish defeat in 1296, Balliol abdicated and was imprisoned in the Tower of London. Eventually, Balliol was sent to France, and made no effort to help the Scots. Scotland was then left without a monarch until Robert the Bruce ascended in 1306. In Norman French his name was Johan de Bailliol, in Middle Scots it was Jhon Ballioun, and in Scottish Gaelic, Iain Bailiol. In Scots he was known by the nickname Toom Tabard, usually understood to mean "empty coat", with the word coat referring to coat of arms. Little of Balliol's early life is known. He was born between 1248 and 1250 at an unknown location; possibilities include Galloway, Picardy and Barnard Castle, County Durham. He was the son of John, 5th Baron Balliol, Lord of Barnard Castle, and his wife Dervorguilla of Galloway, daughter of Alan, Lord of Galloway and granddaughter of David, Earl of Huntingdon. From his mother he inherited significant lands in Galloway and claim to Lordship over the Gallovidians, as well as various English and Scottish estates of the Huntingdon inheritance; from his father he inherited large estates in England and France, such as Hitchin, in Hertfordshire. In 1284 Balliol had attended a parliament at Scone, which had recognised Margaret, Maid of Norway, as heir presumptive to her grandfather, King Alexander III. 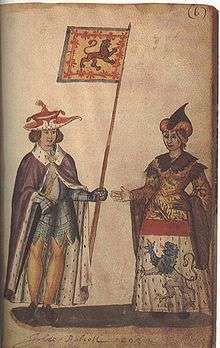 Following the deaths of Alexander III in 1286 and Margaret in 1290, John Balliol was a competitor for the Scottish crown in the Great Cause, as he was a great-great-great-grandson of David I through his mother (and therefore one generation further than his main rival Robert Bruce, 5th Lord of Annandale, grandfather of Robert the Bruce, who later became king), being senior in genealogical primogeniture but not in proximity of blood. He submitted his claim to the Scottish auditors with King Edward I of England as the arbitrator, at Berwick-upon-Tweed on 6 June 1291. The Scottish auditors' decision in favour of Balliol was pronounced in the Great Hall of Berwick Castle on 17 November 1292, and he was inaugurated accordingly King of Scotland at Scone, 30 November 1292, St. Andrew's Day. Edward I, who had coerced recognition as Lord Paramount of Scotland, the feudal superior of the realm, steadily undermined John's authority. He demanded homage to be paid towards himself, legal authority over the Scottish King in any disputes brought against him by his own subjects, contribution towards the costs for the defence of England, and military support was expected in his war against France. He treated Scotland as a feudal vassal state and repeatedly humiliated the new king. The Scots soon tired of their deeply compromised king; the direction of affairs was allegedly taken out of his hands by the leading men of the kingdom, who appointed a council of twelve—in practice, a new panel of Guardians—at Stirling in July 1295. They went on to conclude a treaty of mutual assistance with France – known in later years as the Auld Alliance. John died around 25 November 1314 at his family's château at Hélicourt in France. On 4 January 1315, King Edward II of England, writing to King Louis X of France, said that he had heard of the death of 'Sir John de Balliol' and requested the fealty and homage of Edward Balliol to be given by proxy. John Balliol and his wife. John married, around 9 February 1281, Isabella de Warenne, daughter of John de Warenne, 6th Earl of Surrey. Her mother Alice de Lusignan was daughter of Hugh X de Lusignan by Isabella of Angoulême, widow of King John of England, making Isabella niece, in the half-blood, of Henry III of England. John was also the brother-in-law to John Comyn, who was killed following a scuffle with Robert the Bruce in February 1306, at Dumfries Cathedral. Opinion remains divided on who started the fight and who exactly killed Comyn. ↑ G. P. Stell, "John [John de Balliol] (c.1248x50–1314)", Oxford Dictionary of National Biography, Oxford University Press, Sept 2004; online edn, Oct 2005 , accessed 25 July 2007. ↑ Booklet : A Brief History of the Jermy Family of Norfolk and Suffolk by Stewart Valdar has in it a pedigree of the Jermy family [1221–1850] wherein Sir William Jermy MP 1335 marries Ellin, daughter of John Balioll, King of Scotland and they have a son, Sir John Jermy living 1338 marries Jane, daughter of Sir Roger Hales, kt. There is a note inscribed on a vellum roller pedigree, drawn by John Jermy of Bayfield about 1700 stating "Thomas of Bretherton second brother to King Edward second Count of Norfolk & Earl Marshall of England in the fifth year of Edward II did convey to his brother in law Sir John Jermy knight twoe part of the Manor of Metfield in Suffolk and the third part to his wife for the assignment of her dower as it appeareth by a deed in the possession of Francis Jermy of Brightwell Esq. The Coat of Arms of the Jermy family are a "Griffen" atop armour with a shield with a lion rampant with the banner stating "Splendidum Virtus Insigne". A copy of the booklet created in 1958 is with the British Library.